Peerless Research Group has conducted custom research projects for many leading solutions providers across the supply chain, logistics and materials handling fields to include Toyota, Kronos, Oracle, Amber Road, MercuryGate, Intersys, Dematic and NAACO, to name a few. 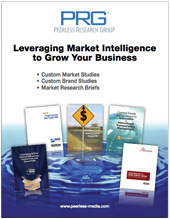 PRG offers a multitude of research products which can be administered to your exact target audience. This will give you the highest level of accuracy in whatever type of research you undertake.